O.M.F.O.–Our Man from Odessa–is the master of crossover par excellence. Born in the port of Odessa (Ukraine), German Popov emigrated to Amsterdam in 1989. As an explorer, German Popov loves to travel around Central Asia making live recordings of everything from the traditional songs and melodies of the steppes to the modern restaurant bands of Tashkent with their tinny keyboard sound. So welcome to electronic Walachia, where folk meets Kraftwerk and where bizarre instruments and electronic sounds combine to create a whole new musical dimension. With his ideas and his musicians he bravely goes where no human ear has dared to go before. Futurism meets folklore imaginaire: Ladies and Gentlemen, we are floating in Eastern European space. His first album on the Essay Recordings label, Trans Balkan Express, put him in the international spotlight and none other than Borat has chosen two tracks from the album - "Money Boney"and "Magic Mamaliga" - for the soundtrack of his latest film. Comrades, It is no coincidence that the first man in space Yuri Gagarin was a shepherd. As a matter of fact, most of the cosmonauts were shepherds as well as some of their American colleagues like, for example, the astronaut William Shepherd. And what about the shepherd dog Laika? Who would not have longed to hear it bark from the orbit...? Is it all a coincidence? Certainly not! Here is the explanation: The USSR was the first country to put man into space. At the same time the Soviet Union was the first country in the world to give absolute political power to workers, peasants and.... Yes! Shepherds! Owing to Pure Shepherds' Logic (PSL), also known as the Logic of Shepherd, which they efficiently applied to everything around them, shepherds have been extremely successful throughout human history. By means of flying machines and rockets they have expanded their pastures to the limits of the stratosphere and beyond. Shepherds, stars and the Milky Way have always been good friends. The sound of a shepherd's flute has often accompanied the flight of falling meteors and lunar eclipses. Eventually, shepherd tunes enriched by the beeping of the Morse code, have dissolved into pulsating clicks and bubbly electronic sounds, making up the Space symphony that glorifies the primordial beauty of shepherd live. 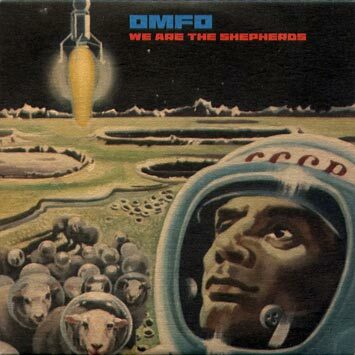 This is an album for present day shepherds. You can enjoy listening to the tunes, when you are on your own or immersed in your shepherd thoughts and fantasies. But you can also dance to the melodies in a circle of your fellow shepherds or shepherdesses. The incessant rhythmic pulsations, captivating tone colours and special effects, produced by electronic and acoustic instruments, as well as the unpretentious and plain melodic patterns sound a bit unusual but definitely very contemporary. Even your flock of sheep might experience a cosmically unreal and transient state, which can eventually result in an exceptionally good production of milk'n'wool. When Shepherds fall in love they sing... The melodies of their songs are slow and melancholic. The lyrics is naïve and beautiful. When in outer space, far away from local discotheques, their creative spirit awakens and they invent new musical instruments. Their simple drums, flutes and mouth-harps become theremins, synthesizers and sampling sequencers. This is how old songs are transformed and updated, gaining a new meaning in a new environment. And where do we go from here? It is a question we are pondering over now. Shepherds of the Universe unite! To promote his projects, OMFO put together a line-up of five extraordinary people: the Transylvanian gypsy wunderkind Vasil Nedea on cimbalom and accordion, the Azeri sci-fi writer and virtuoso Rassul Kazimov on tar and guitar, the freedom fighter and storyteller Bakhtiyar Eybaliyev as percussionist and singer, often compared to a nightingale, and Fay Lovsky, The Lady from Beyond, who plays extremely rare instruments such as theremin and the singing saw, adding an eerie and mysterious mood to the music. All these musicians took part in the recording of We are the Shepherds. When listening to OMFO for the first time, I was surprised about the fact that someone was working on a similar "theme" with me, yet dedicated to a totally different cultural zone. At first glance, what OMFO does seems to be so far away from, for example, my work with Sr. Coconut, Lisa Carbon or projects such as "Flanger", yet to me that difference does not really exist. It is music that somehow denies the dominance of certain cultural stereotypes by bending and twisting them into something that appears to be familiar, yet isn't. It is music that questions both familiar locations in time and space and expands them towards new horizons. Musical themes and topics that seemed to be lost in time and were already closed away in dark, abandoned closets of history are brought back as a valid option, as a new path we may start to take NOW. At the same time what we are listening to evokes a certain doubt inside us: is it fiction, or fact? We seem to be able to pin the music down to a territory or, if not that, at least to a historical moment, while at the same time we can not be 100% sure if it is reality talking, or just what we think reality is...a mere projection born deep inside us, fuelled by longings or prejudice. On a purely musical level OMFO knows which territories, both in form and content, he is walking through and this is what enables him to be playful.